Click this link to Pin It for future reference! 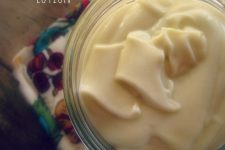 I’m absolutely in love with my recipe for Winter Lotion! But there are those times I’d like to shake it up a bit by using essential oils for a variety of purposes. 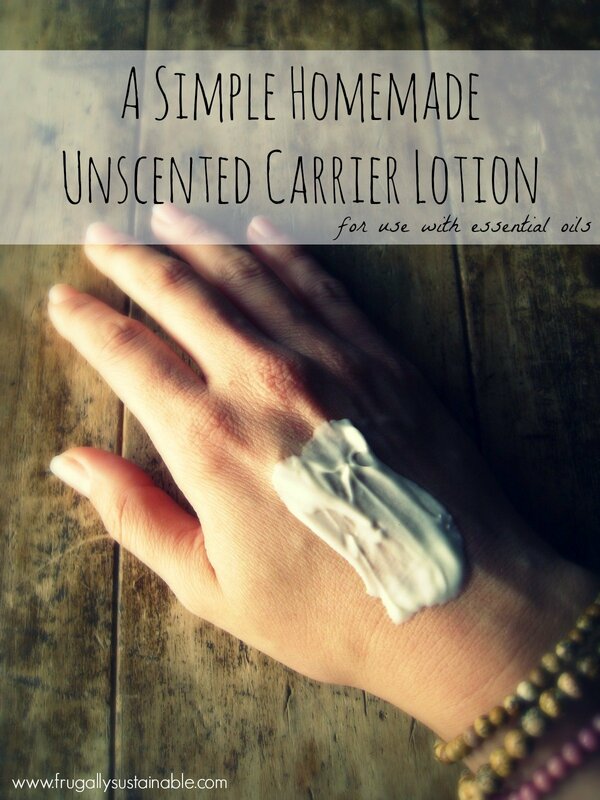 Today I whipped up a batch of this unscented lotion to keep on my bathroom counter for use with essential oils. This lotion is super great! 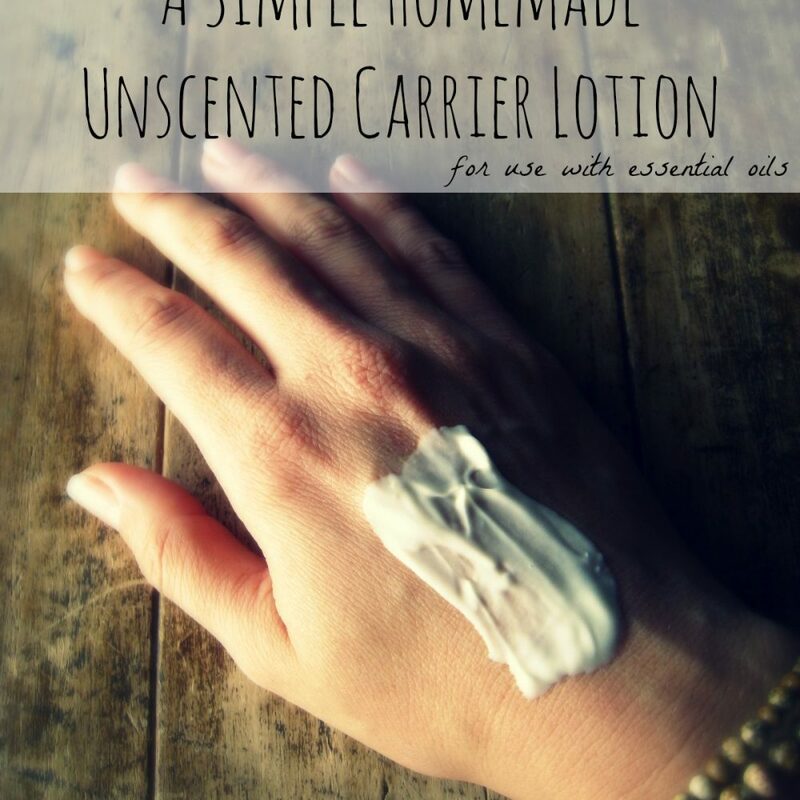 Instead of making several different batches of lotion — more lotion than I could ever use in a reasonable amount of time — each containing different essential oils…I now have a all-purpose lotion that I can customize with each use! *Choose only organic ingredients. I have linked directly to the ingredients I personally use and recommend. In a small sauce pan, combine the oil, liquid of choice, glycerin (or honey), emulsifying wax, stearic acid, and citric acid. Add in rosemary antioxidant (extract), and vitamin E oil if using. Pour into storage jars (I use these). Scoop lotion into your hand, use as is (this is a wonderful lotion for sensitive skin) or add a few drops (2-3) of desired essential oils, apply to skin. Please remember :: Making lotion at home in your kitchen requires the utmost in cleanliness in order to inhibit bacterial growth and prevent mold. This is why it is very important to use aloe vera gel, hydrosols, or filtered/distilled water in the recipe. Likewise, please be sure to use thoroughly cleaned utensils, pans, bowls, and counter surfaces throughout the process. This lotion should last 4-6 month on the counter. There is no need for refrigeration. However, if you see mold growing, toss it out. Tip :: If you use more than one jar/container feel free to store them in the fridge until you’re ready to use them. And just so you know, I’ve never had any mold grow in mine — ever. Don’t forget a preservative you cannot see bacteria growing all the time. Rosemary antioxidant and vitamin E are not a preservative unfortunately. An antioxidant only slows down the oxidation of the oils they cannot prevent mold, bacteria, yeast, fungus etc from growing. Like I said you cannot see bacteria growing either. That is your choice though to choose not to use a preservative I just wanted to let people know. If you have immunity issues I would always use a preservative any little bacteria or mold someone can get sick and die. If your selling you should send it to a lab first and have a challenge test done. I don’t sell but I still use a preservative. I just don’t want to take that chance. So this recipe makes about 14 oz? Also I am wondering about the consistency is it similar to Greek yogurt or thinner like buttermilk? I love this recipe! Mine have never spoiled on me and i don’t add the acids. Just a great recipe, hands down. Are emulsifying wax and beeswax different? Can they be used interchangeably in the recipe? I happen to have beeswax on hand. Sue – emulsifying wax and beeswax are not interchangeable in creating lotions. Beeswax does not have the true emulsifying properties required. Some do, however, use cosmetic grade borax instead of emulsifying wax. I’ve never tried this substitution but please check Mountain Rose Herbs on the use of cosmetic grade borax (https://www.mountainroseherbs.com/products/borax-powder/profile#AID=134299) and emulsifying wax (https://www.mountainroseherbs.com/products/emulsifying-wax/profile#AID=134299). Emulsifying wax )e-wax) is an emulsifier which means it allows the oil and water to mix and not separate. I would not substitute beeswax for it. Stearic acid thickens the lotion. I have used both in my hand cream for many years. I also use germaben II, you only need a small amount to make your lotion last for a long time. I used less than .1% in my recipe and I have hand cream still good that I made in 09. Despite what Mountain Rose Herbs has to say about using ROE as a preservative, I wholeheartedly agree with what Jen had to say. The inclusion of the herbal tea, hydrosol and honey makes it even more imperative that the proper preservative be used. There are several preservatives that are touted as being natural, you need only go to the website for Lotioncrafter or The Herbarie to learn more about them. The liquid you use as well as the PH of the final product needs to be taken into consideration before choosing a preservative. (Surprisingly enough, Aloe Vera Juice does typically contain some sort of preservative although it may be difficult to determine that it’s in there) The fact that people will be scooping this up with their hand further illustrates the need for a preservative. I use Germaben ii E Dee, I get it at bulk apothecary. There are a lot of different preservatives to choose from though. You can try Lotioncrafter or The Herbarie like Barb said above they are good companies too! I have no doubt that Andrea has had super luck with her lotion and with the recipe appearing to be fine. As stated above, we can’t tell when a lotion’s liquid begins accumulate bacteria. 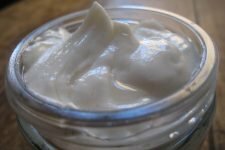 I have made many a cream and lotion for myself with nothing more than Vit E. I always keep it in the fridge or in a cool windowsill (in winter, for example) and have had no issues. Jen & Barb are also correct. Personally, any recipes that I share online, i ensure that preservatives are included, as an option and with a caveat. We must assume that the folks who are learning from us, may be experiencing health challenges of many kinds. I feel it would be better to err on the side of caution and include a 100% guaranteed product. If it’s for sale — this is imperative. For those who definitely do not want to use a preservative, it may be a good plan to make small batches and suggest using within a month if not refrigerated. I don’t dispute that Rosemary extract possesses anti-bacterial properties. There are many choices of herbs that can be used in this way. I’ve used Germaben ii with good results as well. All in all ~ comes down to choices that we make. I think it’s responsible to try to cover all the possible options so people can make informed decisions. I think tea tree oil might be a good addition to help stave off bacteria, etc. Tea Tree EO is a wonderful, natural antibacterial but it is not meant to be substituted for a preservative in a product. Hi, I’m european girl and I always have problem in determining fluid ounces vs weight ounces… In this recipe everything, except 6 fluid ounce, is in weight ounces, right? I was worried for nothing. After I had already added the liquid I weighed 6 fl oz of green tea and found it to be very close to 6 weight ounces. No harm, no foul. And the best part is that this is the best lotion I’ve ever made! It’s not trying to separate, it doesn’t feel greasy and my husband loves it. Thanks for another great recipe Andrea. I understand the concern of adding preservatives, however, it seems contradictory to go to all the trouble of gathering the ingredients, keeping everything clean, and making the lotion, only to add an ingredient that could cause potential problems. I don’t put preservatives in my lotions. I make a small amount or keep it cool. Can we use something other than rosemary? It makes me itch. You are an absolute life saver!! Can’t thank you enough for this wonderful gift. Thanks for taking the time to share.